The CVE September Awareness Bulletin is an initiative that aims to provide further intelligence and analysis concerning the last vulnerabilities published by the National Institute of Standards and Technology (NIST), National Vulnerability Database (NVD) and the IDS vendors’ coverage for these vulnerabilities. Based on this public information I decided to take a look at what has been released during the month of September. 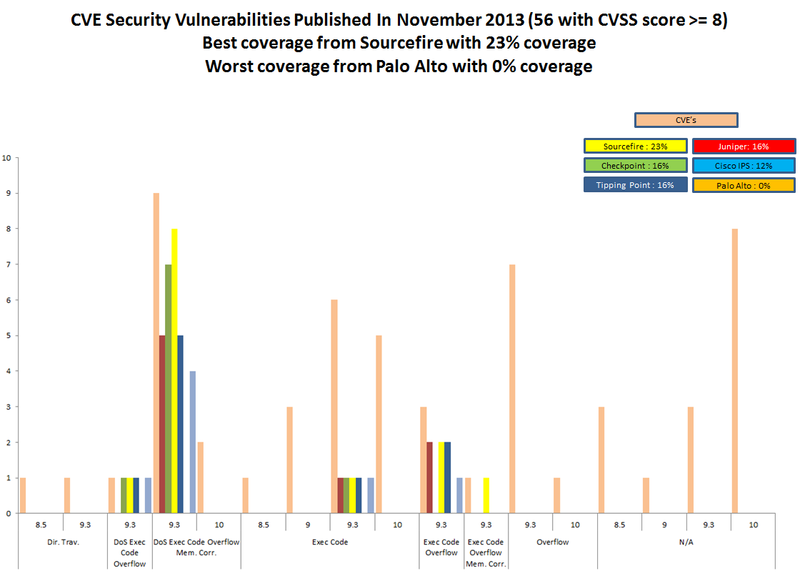 There were 464 vulnerabilities published where 100 were issued with a Common Vulnerability Scoring System (CVSS) score of 8 or higher – CVSS provides a standardized method for rating vulnerabilities using a scoring system based on their different properties from 1 to 10. 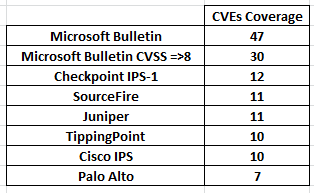 From these security vulnerabilities, I compared the last signature updates available from products that have a significant share of the market i.e., Checkpoint, Tipping point, SourceFire, Juniper, Cisco and Palo Alto. The result is that Checkpoint has the best coverage with 20%. 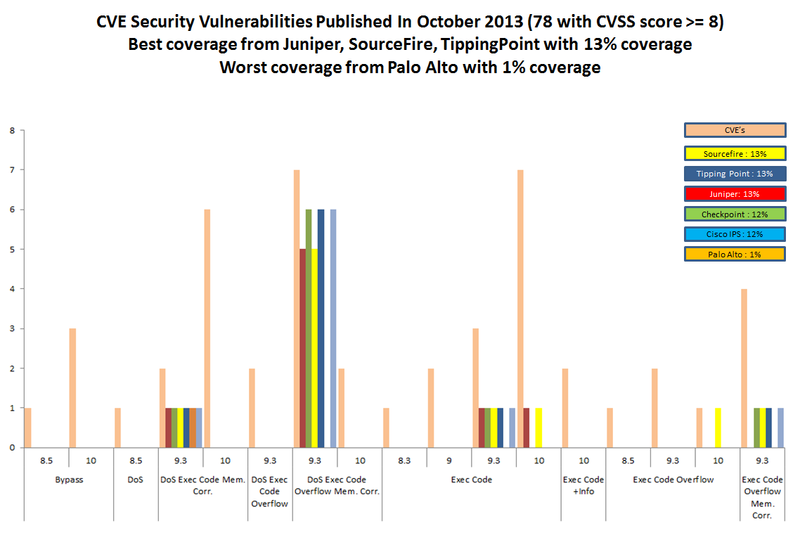 Tipping point and Sourcefire have 19%, Juniper 16%, Cisco 12% and the last Palo Alto with 10%. The vendors analyzed have provided signatures on the same date (10 of September) or few days later. The mentioned signatures and patches should be applied as soon as possible but you should also fully evaluate them (when possible) before applying it production systems. Bottom line, the vendors that were analyzed have a quick response but the coverage should be broader. 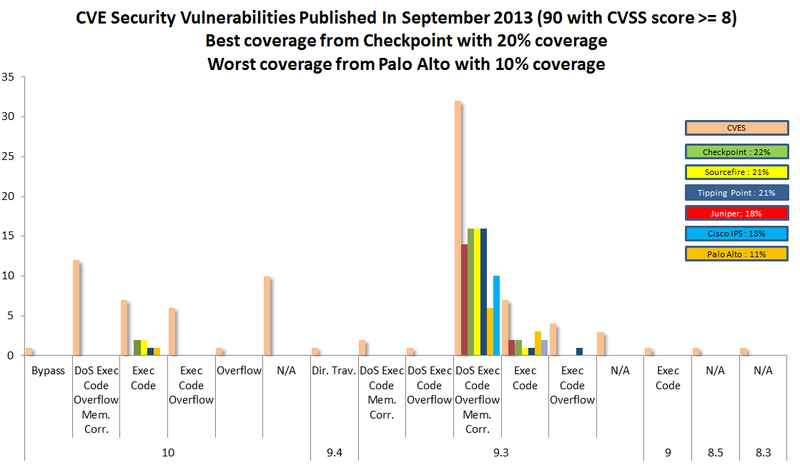 September we saw 100 vulnerabilities with a CVSS higher than 8 but only 20% of them have coverage in the best case (Checkpoint). This means 80% of the published vulnerabilities don’t have coverage. Regarding the vendor response to the Microsoft Security Bulletin Summary for September 2013, the coverage is better and goes up to 40% in the best case (Checkpoint). Interesting to note that some of these vulnerabilities are related to software that don’t have significant share in the market. Worth to mention that 15 of these vulnerabilities (15%) are related to Adobe products and they are not covered. Even if the vendors would have 100% coverage they would not apply to all environments. Furthermore, the likelihood of these vulnerabilities to be successful exploited should also be considered since some of them could be very hard to pull off. So it’s key that you know your infrastructure, your assets and mainly where are your business crown jewels. Then you should be able to help them better protect your intellectual property and determine will be the impact if your intellectual property gets disclosed, altered or destroyed. The CVE August Awareness Bulletin is a personal initiative and experience that aims to provide further intelligence and analysis concerning the last vulnerabilities published by the National Institute of Standards and Technology (NIST) National Vulnerability Database (NVD) and the vendors coverage for this vulnerabilities. This is the most popular list of vulnerabilities used as a reference across the security industry. It should not be considered as absolute but due to nature of its mission and current sponsors – Department of Homeland Security (DHS) National Cybersecurity and Communications Integration Center (NCCIC) – it carries a great amount of adoption across the industry. Eleven of forty published security vulnerabilities are related to Microsoft products. From these eleven, nine of them affect Internet Explorer. 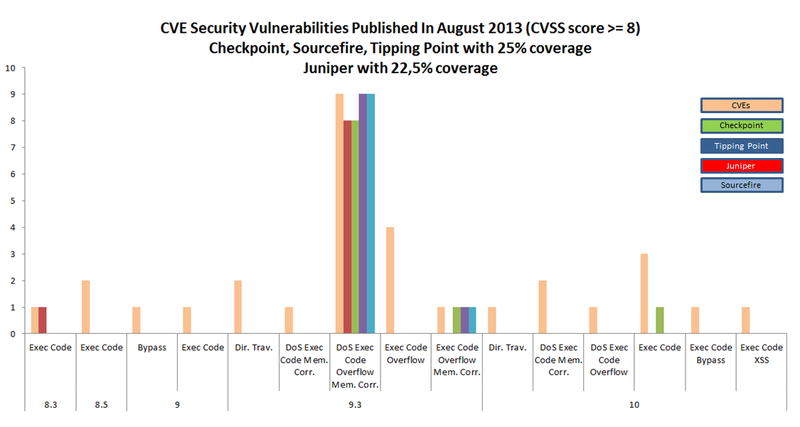 Checkpoint, TippingPoint, SourceFire covers ten of the eleven vulnerabilities. Juniper only covers the ones related to Internet Explorer and not protecting against the CVE-2013-3175 and CVE-2013-3181. Interesting that it looks like that Microsoft patch Tuesday is somehow coordinated with the security vendors signature updates. The ones analyzed have provided signatures on the same date (13 of August). The mentioned signatures and patches should be applied as soon as possible but you should also fully evaluate them (when possible) before applying it production systems. For further reference I include here where you can check the signatures on Juniper NSM and Checkpoint SmartCenter Server. For TippingPoint, on the SMS, go to Profiles. Then, from the navigation pane on the left, click the + sign next to the IPS Profiles to expand the category. Then select the search type (global or standard). The Profiles – Search screen displays and is divided in four areas. In the Filter Criteria are you can click the arrow next to it and specify the CVE id. For SourceFire you can locate rules based on CVE numbers from within your intrusion policy by searching all rules using a certain search filter. Go to Policies – Intrusion – Intrusion Policy. Choose “Edit” next to your policy. Click on Rules. In the search filter, type “reference:” followed by the CVE that you wish to look for. In addition, after deploying signature updates to the sensors you should check which signatures have been enabled by default. Plus you should be checking and evaluating what is the impact on your environment for the CVEs that don’t have coverage. 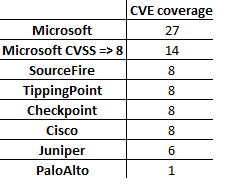 Bottom line, the vendors that were analyzed have pretty quick and decent coverage for the signatures that are related to the big software vendors e.g., Microsoft. 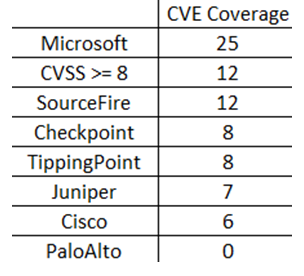 However, in August we saw 40 vulnerabilities with a CVSS higher than 8 but only 25% of them have coverage. This means 75% of the published vulnerabilities don’t have coverage. Interesting to note that these vulnerabilities are related to software that don’t have significant penetration in the market. Noteworthy, is that 5 vulnerabilities are related to Mozilla Firefox (CVE-2013-1701, CVE-2013-1702,CVE-2013-1704, CVE-2013-1705 and CVE-2013-1710) and they are not covered. Even if the vendors would have 100% coverage for all vulnerabilities they would not apply to all environments. So it’s key that you know your infrastructure, your assets and mainly where are and what are your business crown jewels. Then you should know how to protect your intellectual property and what will be the impact if your intellectual property gets disclosed, altered or destroyed.